What It Is: They’ve come a long, long way baby – it’s hard to believe that the makers of the world’s most ubiquitous tablet were also the developers of those boxy-yet-kinda-cute Macintosh computers of yesteryear. 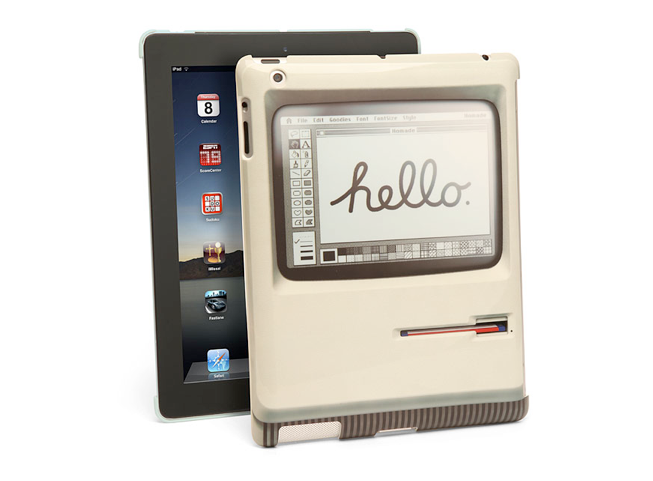 For anyone on your gift list that REMEMBERS life before the tablet-netbook-laptop-PC, this Padintosh iPad skin is a fun homage to the history of the Apple brand. Aside from looking sharp, this handy skin will also protect your precious iPad from spills and tumbles, and fits both the iPad 2 & 3 for those looking to upgrade their wares this year. Who It’s For: Your iPad-loving dad that bought you your first home computer. Your hipster journalist brother, to feed his iPad addiction and give him some analog street cred amongst his fellow writers. Your college student cousin, because iPads are the new notebooks…literally. Want a Love Is Art bonus entry? Just Pin this to Pinterest and leave a comment below with your Pin + what you think of the idea! http://pinterest.com/pin/168955423492910812/ This is so cute, reminds me of grade school classes and the turtle mac program!